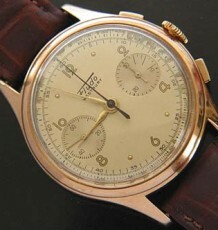 Vintage Swiss Chronograph with high grade Venus movement. 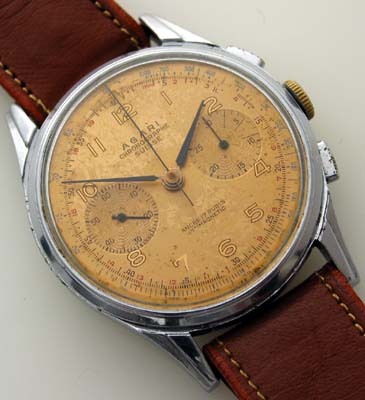 A nice vintage Swiss chronograph wristwatch with a large stepped lug steel case. 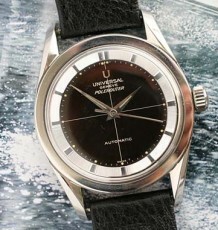 The Swiss made 17 jewel, Venus 188 manual wind movement, was just serviced and keeps good time. 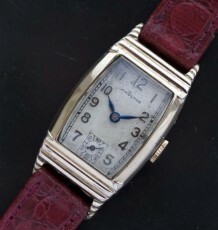 The Stainless steel case is in very good condition with a very small amount of wear at the edges, but far less than one would expect over 60 years. The copper coloured dial with foil Arabic numerals has a subtle patina that adds to the overall vintage look of this dramatic timepiece. The watchcase has fixed lug bars and is supplied on a new vintage fold over calfskin strap. 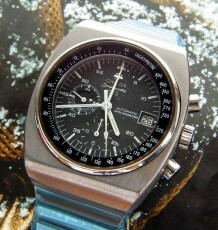 The case measures 38mm wide by 46mm long.